I had a ton of fun in preparing this lesson! I hope you got as much fun going through it. And I am pretty sure you will have much more fun with the exercises... good luck! Note that some of the solutions use a tactic called a "pin". We had the chance to see a couple of examples during the lesson but I suggest that you have a look in the glossary for a definition of this tactic. Algebraic notation is used in this page. If you did not have the chance to complete lesson 6, I suggest you take some time to go though it in order to learn this notation. 1. 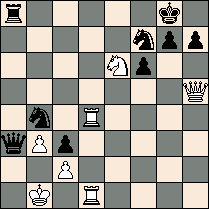 Find the checkmate moving sequence and identify the pattern in the following diagrams. a) White to move, mate in one move. What is the move White must do? What is the checkmate pattern used? 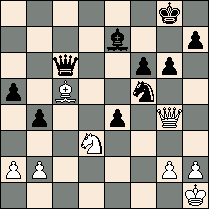 b) Black to move, mate in 3 moves. What are the moves he must do? 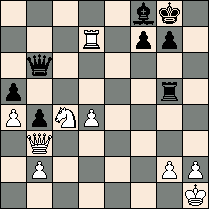 c) White to move, mate in 2 moves. 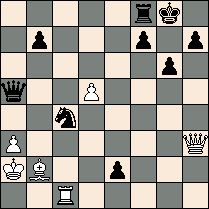 d) Black to move, mate in 2 moves. 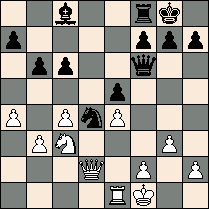 e) Black to move, mate in 2 moves. 2. 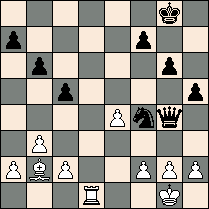 In the following diagrams, a player has the possibility to checkmate his opponent. I will indicate the checkmate pattern to use and you have to find the winning moving sequence and the number of moves the player needs to do in order to reach the checkmate position. a) Black can checkmate with a lethal kiss. 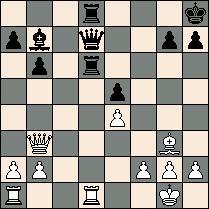 b) White can checkmate with a rook-bishop tandem pattern. 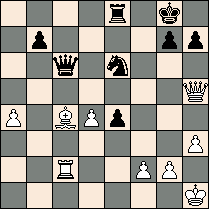 c) White can checkmate with a corridor mate. 3. 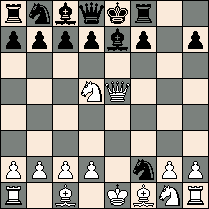 In the following diagrams, a player has the possibility to obtain an advantage in the game by using a checkmate threat. Answer the questions related to the related position for each diagram. This exercise requires a lot of concentration as the difficulty level is quite high. I recommend that you to try to solve the problem without looking at the solution for help. If you find that the problem is too hard, I added some clues that could help you in your analysis. To see the clues, use the corresponding link at the end of the question. What will be the material gain after the plan is executed? b) White to move and, although the material seems almost balanced, he has a checkmate threat that could completely change the game. If the black queen was not protecting the rook on e8, White could then checkmate the black king... he needs to exploit the position to his advantage. Are you able to find the winning move? What is the checkmate pattern used in his threat? 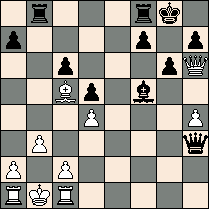 c) White to move and he is two pawns down. 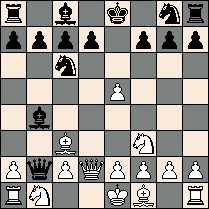 It looks like Black can even win a piece since two white pieces are threatened: the bishop (attacked by the e7 bishop and the black queen) as well as the knight (by the e4 pawn). White decides to limit the damages by playing 1. 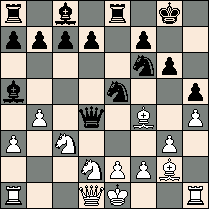 Bxe7 which captures the black bishop, eliminates one of the threats and exchanges a piece by the same time. He thinks he will be able to save one of the threatened pieces after his opponent chooses to capture the other on the next move. But this defense does not work for White... because of a checkmate threat. Explain why White's defense does not work as they will still be loosing an extra piece if he chooses that path. What will be his material gain once he will have executed his plan? If you liked doing these puzzles, you will find below some books that could definitely give you long hours of fun. When you are done, you can continue with the next tutorial and explore the tactical world !